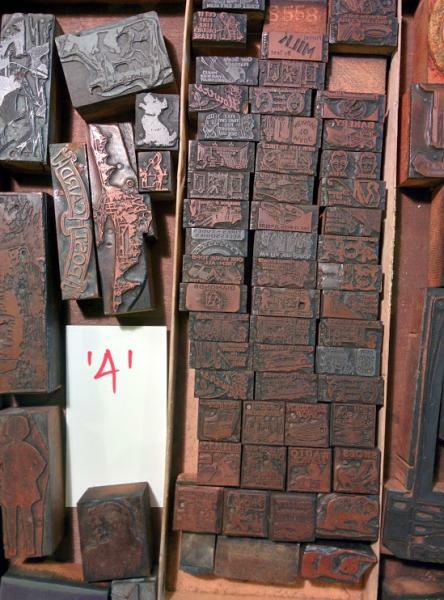 Cash and Carry Items include Wood Type, Foundry Type, cases, cabinets et. More pics and inventory per lot are forthcoming. Please see http://www.slowprint.com/notice-and-terms-of-sale for important info about this sale. If you are following our sale, please note that I’ve added a few dozen more pics. Midwestern friends are welcome to come preview, and make offers on items to take away. 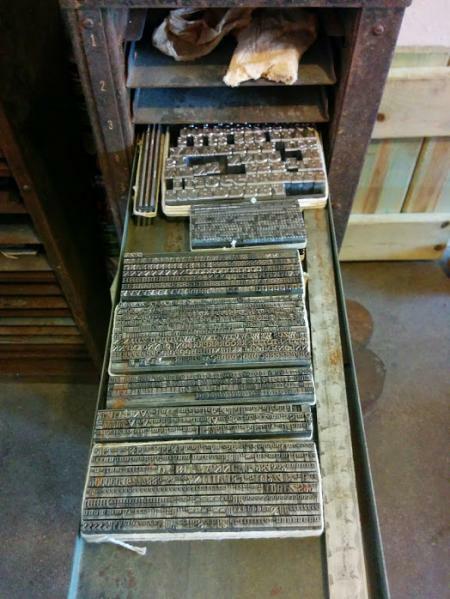 Aluminum bases, speed quoins, clean foundry type in tied-up fonts, ink, etc. Presses and other materials per the sale announcement. You do not have to be present to bid, but the buyer must arrange for pickup before 1pm, Oct 22. 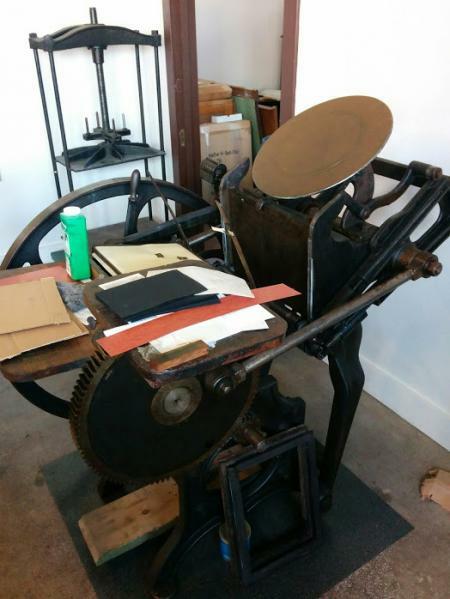 With many thanks for forty some years of letterpress. We need to move this equipment as soon as possible. Please EMAIL me ([email protected] — NO CALLS PLEASE) with “Slow Print Sale” in the subject line if you are interested and willing to come and pick it up. Pick up dates will by arrangement with the property manager, toward the last week of October. Best offers on individual pieces, rec’d by October 15th will take it, unless we get a verified offer for the whole lot. Pick up only, in Dubuque Iowa, 3 blocks from US 61/151. $15-25K? OBO for the whole lot, best offer before Oct 15th. Whatever is not removed entirely before November 1 will be trashed, dumped, scrapped or donated to charity. As Is. No warranty, no refunds, no returns. No dock, ramp goes up to ground-level alley door, easy out with appropriate equipment. You pay for handling, shipping, and whatever. All presses in very good to excellent condition, with accessories, etc. Near new rollers. Many other items, including foundry and somethin well over 1000-maybe over 2000, maybe over 3000 pieces of wood type. Who knows. Desks, fans, shelves. Misc tools and other stuff. Come see it after October 3rd. I can be in Dubuque in 20 minutes. Let me know when you’re coming. However, I will be unavailable after Oct 15th through early November, and all will be disposed before I leave. I have tried everything in my power to keep this facility together and have had the rug pulled out too many times by circumstances beyond my control, I guess this is the end of the road. I now have to try to keep my home. PS, oh, if you were still expecting us to be moving to Hamilton, that’s one of the rugs that got yanked. After six months of discussion with the Museum, and literally days before the deal was to be finalized, the Board of the Two Rivers Historical Society told the Museum Director to refuse our donation. Apparently we accidentally applied for a grant (to pay for the move) with a ‘proprietary’ funding source.